...And The Streets Will Flow With Whiskey features rowdy folk-punk traditionals and is a testament to the high-energy folk-punk dance craze that is a Zydepunks show. 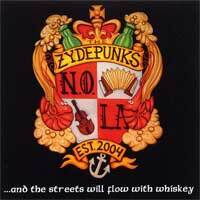 Cajun punk, Yiddish riddles, Irish war songs, and original songs in English and German are a small demonstration of why the Zydepunks astound new audiences. For fans of the Pogues, Gogol Bordello, and the Ukrainians.